Home» Ap new gos » AP Mines/Minerals Measures to control illegal buying/selling/storing/transportation Rules as per G.O.NO 17. 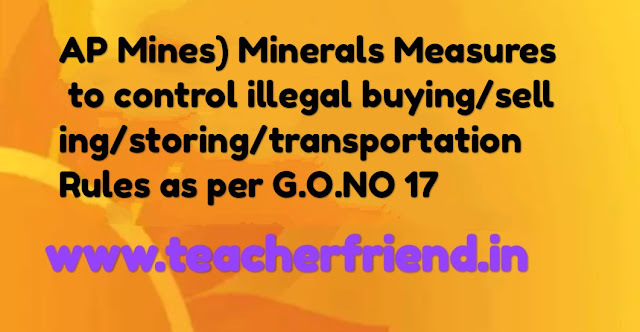 AP Mines/Minerals Measures to control illegal buying/selling/storing/transportation Rules as per G.O.NO 17. AP Mines/Minerals Measures to control illegal buying /selling/ storing/ transportation of minerals The Andhra Pradesh Mineral Dealers Rules 2017 as per G.O.MS.No.17 Dated: 29-01-2018. G.O.Ms.No.537, Ind.& Com. (M.I) Dept., dt.11-10-2000. From the DM&G, GoAP., Lr., No. 14356/P-MDL/2017, Dt. 05.07.2017. In the G.O. 1st read above, the Government notified the Andhra Pradesh Mineral Dealers’ Rules, 2000 to regulate the possession, storage, trading and transport of minerals and mineral products to check the evasion of royalty or seigniorage fee and to prevent illegal mining/ quarrying and transportation in the State of Andhra Pradesh and for the purposes connected therewith. The Director of Mines & Geology, GoAP., has submitted proposals to Government vide letter in the reference 2nd read above for issuance of New AndhraPradesh Mineral Dealer’s Rules, 2017 by repealing A.P. Mineral Dealers’ Rules 2000.
to inspect and check any premises or factory / industry where the mineral is stored before it is processed / manufactured and exercise the power of seizure of mineral before it is processed and converted into a finished product, if it is found that such mineral has not suffered royalty and / or dead rent. principle of Intergenerational Equity as laid down by the Hon’ble Supreme Court in a plethora of decisions. With the existing staff, regulatory and enforcement mechanism and resources at the disposal of the Government, it is not possible to check the raw material receipts at each and every mineral based industry in the State before the mineral is processed, resulting in large scale evasion of mineral revenue to the State Exchequer and also encourages indiscriminate exploitation of natural mineral resources in the State, which should not be allowed. As such, to protect the public property, an alternative effective regulatory mechanism is needed with the available man power.